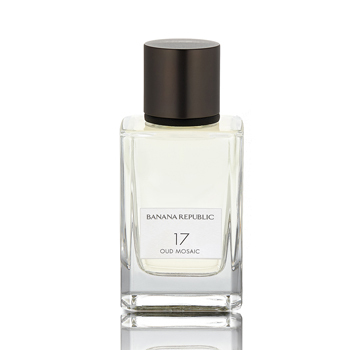 BANANA REPUBLIC Icon 17 Oud Mosaic is an Eau de Parfum. Award winning perfumer Claude Dir is proud to create Oud Mosaic as "a scent for our shared global future: a mosaic of internationally-beloved aromas, bringing together the fruity notes we love in America and Western Europe, combined with the smoky woody warmth of oud that is necessary in the Middle East, along with the delicate floral freshness that is expected in Asia. Top notes of White Pepper, Cardamom, Plum. Heart of Turkish Rose, Labdanum, Saffron. Base of Oud, Amber, and Musk.